Comprova, our largest collaborative journalism project to date, wrapped after the second round of voting in Brazil on October 28. The project brought together journalists from 24 newsrooms, who worked together virtually, using a shared CMS and an incredibly busy WhatsApp group, to find, verify and collaboratively report on 149 examples of misinformation over the ten weeks leading up the second runoff for the Presidential election. August 15: Grupo Abril, a large media group, which included three Comprova project partners, filed for bankruptcy protection and laid off 900 employees. August 31: the top electoral court ruled that former president Lula da Silva could not run for a third term for president while serving his 12-year sentence on corruption. September 2: A huge fire ravaged Museu Nacional. September 6: Jair Bolsonaro was stabbed at a campaign rally. Over the course of the 12-week project that started August 6, partners selected examples of misinformation that had passed the tipping point of virality (the team measured this using different tools to assess whether a rumor or piece of misleading or fabricated content had jumped out of the online community where it started, or had crossed platforms and was moving with velocity.) One of the greatest challenges of these projects is working out this tipping point. If you report on a small rumor, you give it unnecessary oxygen. If you leave it too late, it’s very difficult to slow down or stop. One partner would begin a verification report, documenting the checks they had made, the tools they used and the evidence they had gathered. Then the project editor would send a message to the other partners via the main WhatsApp group and other partners would review the work and confirm or offer suggestions on any additional information that was needed. To publish a report, at least three partners had to confirm the findings and assign the organization’s logo to the bottom of the report in the CMS. On average there were about 9 partner logos listed at the bottom of the reports. WhatsApp has very high penetration in Brazil and we knew that it would play a central role for Comprova. We are proud to be the first journalism non-profit to work with WhatsApp using enterprise software, which enabled us to sort through the almost 70,000 questions and tips we received from the public asking about content online they found questionable. For the last month of the election, we were receiving almost 2000 messages per day which meant we had 10 journalists and journalism students reviewing these questions, finding patterns and passing along the most pressing questions to the central team. Comprova was very much a project driven by our Brazilian partners. We provided early training on the tools, the methodology and best practices for reporting on disinformation, but the project was a success because of the dedication and enthusiasm of our partners. We want to say a huge thank you and to name all of those who were involved. Comprova had an editorial team of five that worked out of the offices at the Fundação Armando Alvares Penteado campus. Sérgio Lüdtke led the editorial direction on the team. He was supported by part-time associate editors José Antonio Lima and Rafael Garcia. For the first time on our collaborative project we hired part-time spots for a social media creator and social media strategist. We had three social media creators during the project: Marcela Tavares, Ricardo Pieralini and Helio Miguel Filho. Our social strategist, Guilherme Conter, worked off site and with our web development team on SEO and ensured that all of those tracking pixels were in place for the project. Pedro Burgos pitched in to establish our WhatsApp number and continued supporting the project by creating tools to help us analyze Comprova’s reach. We were lucky enough to have Harvard Kennedy School Digital Fellow Yasodara Cordova with us in the U.S. to work on questions send in to our WhatsApp number; Yaso created shortcuts, trained journalists on how to respond and kept us all apprised at the types of questions and rumors the number received. These are the people who on a daily basis kept Comprova running smoothly and made sure our WhatsApp number was promoted to a wide audience. There has been help and encouragement on the ground by so many of the top journalism leaders in Brazil. Adriana Garcia has worked with us since February to bring partners together, help plan events and keep the project going when it looked — as it often does during collaborative projects — like it might all fall apart. Angela Pimenta, director of Projor, was one of our first points of contact and she said about this project, “when I decide on something, I decide.” It was that type of focus that kept us all moving forward together. Daniel Bramatti, a journalist at O Estado de S. Paulo and president of Abraji, has been a project stalwart. He kept the partners focused on journalism fundamentals and offered Abraji to be the coordinating organization on the ground, which helped tremendously. There were also a number of organizations that lent their technology or services to Comprova. 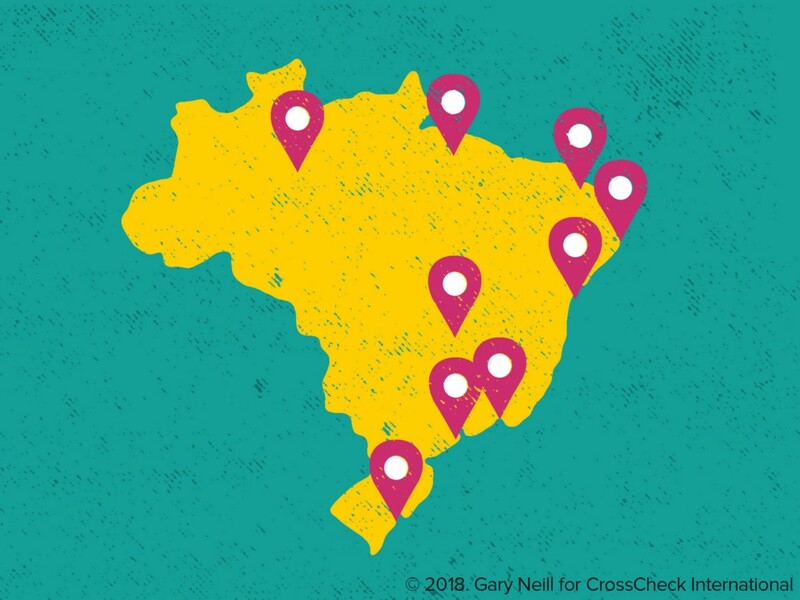 Institutional Partners include Abraji, ANJ (National Association of Newspapers in Brazil), Aos Fatos, FAAP, Ideal H+K Strategies, the Brazil office of Harvard University’s David Rockefeller Center for Latin American Studies, Projor, RBMDF Advogados, Eleições Sem Fake and Textual Comunicação. Technology Partners include Chartbeat, CrowdTangle, NewsWhip, Stacker, Torabit, Twitter and WhatsApp. Google News Initiative and Facebook Journalism Project provided the funds to make this project a reality and for that, we are forever grateful. There is ample evidence that mis- and disinformation will continue to propagate in Brazil and collaboration is the only way to combat this problem. Comprova is committed to seeing what is possible for a 2.0 version in 2019. We hope you’ll continue to follow our Twitter handle and Facebook page for project updates.